This is old version YouTube Music 1.35.7 apk for Android, you can install it if you want to downgrade or install old app. It is top Music & Audio apps from Google Inc..
You can listen recent and popular song. New artist and album always comes every day. You will notice latest update of songs immediately from this app. It is similar with bookmark mode, if you need certain information and news for favorite artist, you can put him or her into your music preference. Advanced setting will give so many options on streaming. Generally, YouTube will provide music and video to viewer. However, you can switch into music mode. This system is new but very useful. One wonderful benefit in this app is classic music. For music freaks, uncommon music or classic songs are challenging. They might keep nostalgic moment after listen one old song. By using this app, you will get them easily. You do not must go to music store to search the rare album. Smartphone with this app will serve your needs. Therefore, YouTube Music for android is the best way to enjoy music every day. 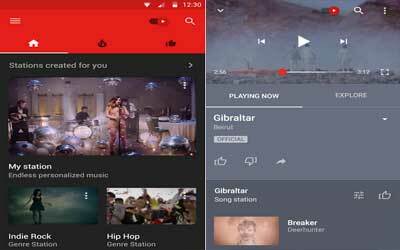 New: Listen to your YouTube playlists in the YouTube Music app! Find your saved playlists in the Liked music tab, and discover new playlists in Search. This feature will be rolling out to users over the next several weeks. Fixed: A bug in Offline mixtape that was preventing some users from turning it on or off, or allowing playback.